I love that people are willing to help me figure out which stories to share first from the adventures I had in Oregon and California! The first person to reply to my request for opinions was a fellow blogger here in St. Louis! I haven’t met her yet, but Yokasta Schneider of Get U Moving Fitness is a member of a Facebook group I’m in and when she scrolled though my vacation Instagrams, she mentioned this photo as one she was interested in knowing more about. Since every picture tells a story, here’s the story on this one! On Saturday, I was driving out to Hanford, California to see my good friend Dino Giacomazzi. I had arrived in the San Joaquin Valley a little earlier but pretty much stayed in one place during daylight so my exploring had been really limited and in the dark. So on Saturday morning as I drove south from Fresno, I found myself torn between two things — 1) I had been daydreaming about visiting Dino’s dairy a really long time and 2) I was seeing too many interesting things to stay on my chartered course! I headed south on 99 and through the fog I saw a sign pointing to the headquarters of Sun-Maid. Yes, that familiar face from the red raisin box? It was on billboards telling me the Sun-Maid Store was nearby in Kingsburg. Once I got off the freeway, I couldn’t hold back much longer. 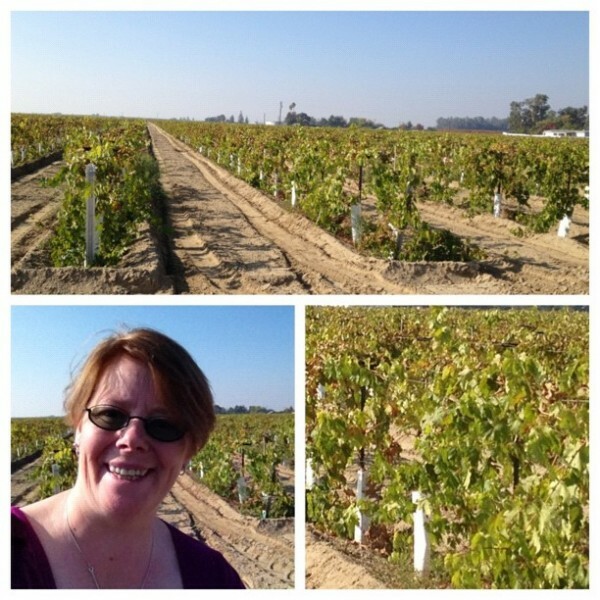 I had to pull off and take pictures of one of the raisin vineyards alongside the road. As many times as I have seen grapes in the field, and as many times as I’ve been in vineyards, I never once had really thought about the fact the grapes I was looking at may be grown for raisins instead of wine or table grapes. Kind of goofy I know, but it just never crossed my mind. And come to find out 40 percent of the world’s raisins are raised right there in the San Joaquin Valley! I picked up some tips from this Sun-Maid video. Sun-Maid is a grower owned cooperative. About 95 percent of California raisins are made from seedless grapes. The fruit is used for snacks, baking, cereals, granola, candies and more. Harvest is in August or September. There are two ways raisins are dried in the sun — picked and placed on paper for sun drying in 2-3 weeks or dried on the vine (takes an extra 3-4 weeks). Golden raisins are dried mechanically. 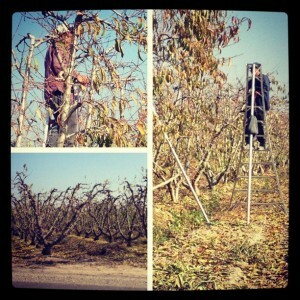 Since Yokasta also asked about another photo, this one of a crew pruning in a nectarine orchard just down the road, I figure I’ll put it here at the close of this post. The crew was setting up ladders and moving around quickly trimming back trees so they will be ready to go in the spring as bloom starts! Pretty wild to see dozens of people pruning trees when I’m used to trimming one tree at a time. They were nice enough to let me take photos for a few minutes. Not sure whether the orchard produces for fresh market, for jellies & jams or what, but I have to say, it was taking some work! To see other posts in the series of 30 days of daily blogging, just click on this image wherever you happen to come across it. Here’s a quick list of the posts so far — there is a little of this and a little of that in the series, just like there is in my blog at any time! November 27th Why would a farmer plant GMO cotton? November 9th What an incredible week!